vintage snapshots ~ what a "find"! While I haven't whole heartedly committed myself to the acquisition of vintage snapshots, I have been keeping an eye out for likely sources of such things. Usually that means antique or "curiosity" shops. 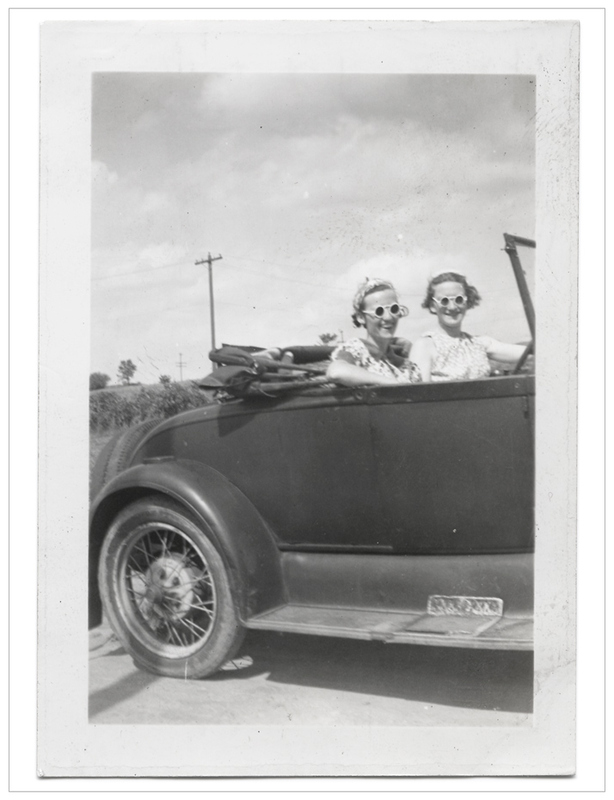 While I have not fully come to grips with my attraction to snapshots, I am aware enough to know that, when searching through bins and boxes of vintage snapshots, what pricks my eye and sensibilities are pictures which could be described as representative of the human condition. That is to write, pictures of ordinary people doing ordinary things and expressing a wide range of attitudes / emotions in the process. My 2 most recent finds, pictured above, are especially loaded with humanity in evidence. The 2 halloween pictures, masked and unmasked, are without a doubt the highlite of my nascent vintage snapshot collection. 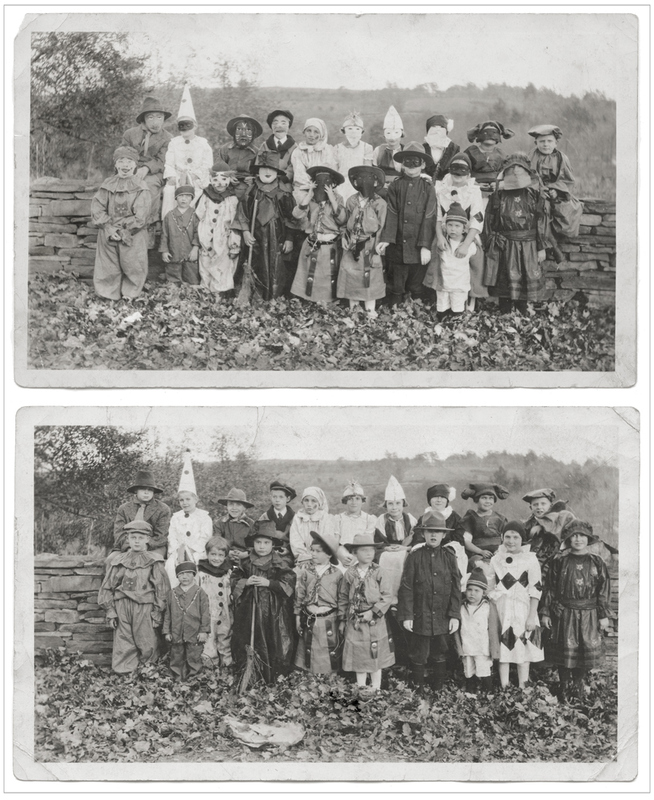 The pictures are very nearly a century old - mostly likely c.1920, as indicated by the WWI doughboy costume (front row, 4th from right). iMo, individually, each picture is something of a jem. Together, they are awesome. Re: the women with the goofy shades - it just made me laugh when I saw, so I had to have it. Re: I had to have it - imagine my surprise when I found these 2 jems that, in fact, I already had them. After 20+ years of languishing in a box in my attic in my mother's early-life photo album, I "discovered" them a few weeks ago ... which means that they are even more special than if I had discovered them in a box in a curiosity shop. ... I revisited the album in search of a picture of my mother at the approximate age of the kids in the picture. It was then that I found a studio portrait of her with a nearly identical expression and facial features as the kid in the back row, 2nd from the right. Without a doubt, that kid is my mother. FYI, I don't believe my mother is in the goofy shades picture. My thought is that she made the picture in as much the album is replete with pictures of her and her friends having lots of fun.